Did you ever wonder, ‘Why didn’t I think of that‘? Riverbed invented the next generation hyper-converged solution specifically designed for Zero Branch IT. 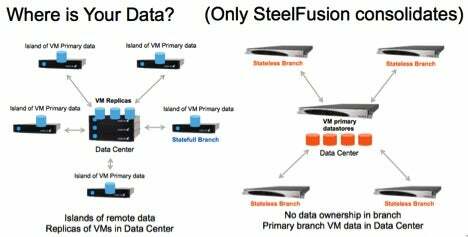 It’s called SteelFusion, and it’s not like any other hyper-converged infrastructure solution you’ve ever seen. In the beginning – to borrow a phrase, hyper-converged solutions were designed for the datacenter or very large regional datacenters. These original solutions create islands of (primary) storage. They are designed to have primary copies of data at each island where they are deployed (north, south, east, west). Backup and protection is done the old fashioned way, with backup software or replication software at each location. They can be great for quick datacenter solutions and are usually faster to deploy and easier to scale out compared to legacy storage and server solutions. This is great if you are designing a solution specifically for the datacenter where compute, storage and networking are much larger projects with bigger budgets. Does that make sense when you have 10s or 100s of branches? Enter hyper-converged branch IT. SteelFusion has completely turned the hyper-converged approach upside down. This unique invention projects data from the datacenter to the branch and keeps master containers of storage in the datacenter. The island of storage disappears and the picture looks clear and different because it’s consolidated in the datacenter. The result is Zero Branch IT with high-speed data access for all branch locations. Unlike other hyper-converged solutions, with SteelFusion your data is in the datacenter, where you really want it to be. Your branch users are happy because the projected storage containers are smart-cached locally at the branch using high speed SSDs and redundant RAID disks. Branch users get high-speed performance and IT gets rid of legacy backup methods at the branch. Why is this approach special? There are 4 major reasons that Riverbed has an edge on hyper-converged branch IT. Centralized data. As users create content at the branch, it’s continually replicated and deduped over the wire. Value = 100% centralized data and low RPO with much less bandwidth than legacy solutions. Instant disaster recovery. You can boot a server on a low speed link across countries in under 10 minutes in many cases. Value = fast disaster recovery compared to legacy solutions. Eliminate all branch backups. Value = . . . well, who doesn’t want to eliminate branch backups? They are tedious and unreliable. Centralized management. All branch services can be created in the datacenter and projected quickly to any location around the world. Value = datacenter admins can manage and control everything from one location using best of breed tools that you most likely already own, like virtualization and storage. Leverage your existing investments. Why other hyper-converged solutions aren’t designed for the branch. All other solutions are designed for datacenters with datacenter scale. They are typically much higher in cost and overkill for branches. They are good at supporting 100 VMs and above (typical of a datacenter), whereas SteelFusion is designed for 1 to 100 VMs (typical of a branch). No other solution embeds WAN optimization, which is a requirement in many high-latency, low bandwidth sites. When you deploy traditional hyper-converged solution at a branch, your primary data is at the branch whereas SteelFusion consolidates your data back to the datacenter. It’s not just cool technology – it works extremely well for branch locations and delivers datacenter class agility and security. Branch locations can be ships at sea, remote locations in far away countries or large regional offices. Protect your data in your datacenter with better than average RPO/RTO. Survive locally with encryption at rest. Deliver great performance that users expect while your data is in the datacenter. Stay tuned for my next blog, which will cover the Dual Node Architecture in the latest version of SteelFusion 4.0.